Social Media is playing big tools to communicate and connect with each other in a simple click. Young generation attracts and using these platform in large scale to link the world through various social media platform like - Twitter, Facebook and Google Plus. As you know that if good things come in your life, then negativity is also with that. These social media platform is facing the big problem of trapping, hacking, intrusion and spamming. A parallel platform has raised to hamper the positive impact of these tools. The major hacking and spamming hit the Twitter account of users. This platform is suffering from the large context of these issues. Sometimes you will listen to the news to hack the twitter account of celebrities. 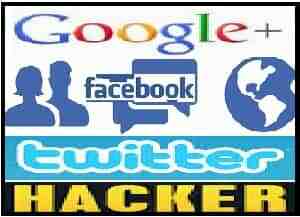 The basic discussion point is, how to save social media account from hackers, spammers, and intrusion. 1. Change your password - You have to change your account password on monthly basis. Make your password with the combination of the digit, alphabets and special sign given above the number key. Try to choose the tough and long password for the account. Choose the separate password for the different social account. The password strength should not be less than 10 words. 2. Be Careful To Open The Link - This is the big analysis point for you. Different type of link shared by the people through e-mail, blog posting, comment box and off-course on social media. All links are not safe for you. These links are also used to know about your personal information and password for hacking. When you click on this link, all information transfer to spammer and hacker. They can misuse your information for the online or offline transaction. This is called Phishing. So, don’t click on suspicious links. 3. Make Separate ID For Separate Accounts - Generally, users login other websites with social media account, that site owner know everything about your profile. They can use your information to hack your site. Every site doesn’t indulge in this type of activity but you should be conscious and confirm the authenticity of the site. Avoid sharing the personal information in your login account. Remove third-party approach to Social Media Apps. This is the best way to save the account from Spammer, Hacker, and Intrusion. 4. Phone Number Of Social Media Account - This is another way to save your account from hacker except save the password. This way is also mentioned in your twitter account. You have to register your phone number. To register the phone number, you have to go in setting and privacy option of your account and save phone number in a given option. If you have submitted your phone number, social media company send OTP (one-time password) number. This can be used only one time to reset the password. This number will be flashed on your registered mobile number. Some time they verified your existence with the generation of second OTP number. When you provide the number in the given box and submit the button, they confirm and process the request. This is a completely safe process. These tools are good and simple to apply.